Extra White is clinically shown to deliver an average of 2 shades whiter teeth after just ONE brushing and an average of up to an unparalleled 9 shades in 30 days. Delivers maximum removal of deep set teeth stains, without sensitivity. Shown to support gum health. Just brush and whitenno need to change your daily habits. Restores bonded teeth, veneers, caps, dentures to their original shade. Comes in modern, sleek airless pump for a premium use experience and features a new, fresh and delicious Triple Mint flavor. Contains calcium, magnesium, phosphates and fluoride which remineralize and restore enamel. Free of silica, parabens, sulfates, known allergens, animal byproducts and BPA. It's also Kosher. Safely whitens teeth below the surface for deep-set stains. 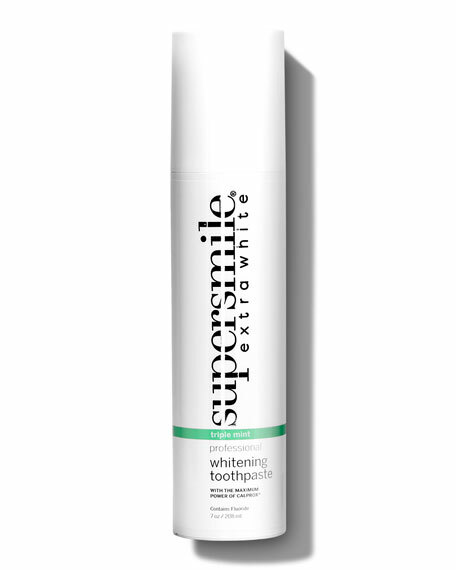 Combine with the Professional Whitening Toothpaste for safe and superior whitening. Safely whitens teeth below the surface for deep-set stains. Combine with the Professional Whitening Toothpaste for safe and superior whitening. Together, the two whiten above and below the surface, clean, protect, and strengthen safely. 3.6 oz.